Map of Florence Italy, tourist information. On this Map of Florence Italy page we are going to discover one of the most visited italian towns. It is considered worldwide the origin of Renaissance, is a place full of Architecture and Art, since 1982 UNESCO World Heritage Site. Florence is reconized as one of the most beautiful and important tourist attractions in Italy and in the World, with numerous monuments and museums like Santa Croce, Ponte Vecchio, the Duomo, Piazza della Signoria, the Uffizi, and Palazzo Pitti. Florence is the capital city of the region Tuscany, located in a scenographic position, surrounded by charming hills and it is crossed by the river Arno. -Left Click on any of the 4 arrows in the top left corner and the map will pan in the direction of the arrow. -Click on the plus or minus symbols to zoom in and zoom out. -Click and hold the left mouse button to drag the map across the screen. 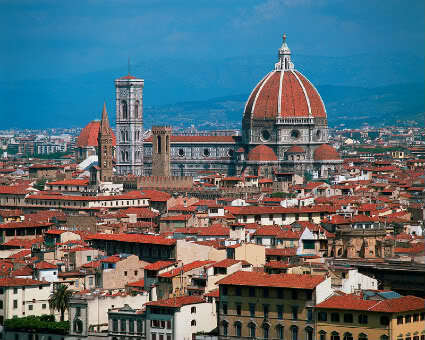 The artistic heritage of Florence is among the largest in the world. The city's historic center creation lasted over three centuries and had a predominant influence in the development of architectural and monumental art in Italy first and then in Europe. The discovery of the Tuscan capital can start from the Basilica of Santa Maria Novella, built since 1246. The beautiful facade with polychrome marble inlay work was completed by the Florentine architect Leon Battista Alberti between 1456 and 1470. Inside are masterpieces including the Trinity painted by Masaccio. A short distance from Santa Maria Novella, along Via del Giglio, you can reach the city's oldest Church, the Basilica of San Lorenzo, rebuilt in the eleventh century, by the Medici family who chose it as family Church.